The UK Government introduced the European Union (Withdrawal) Bill – originally promised as the Great Repeal Bill – in order to give effect to Brexit in domestic law in three (theoretically) simple steps: (1) repeal of the European Communities Act 1972, (2) retention of all currently applicable EU law in domestic law and (3) conferral of new powers to the government to adapt the retained EU law in order for it to work properly in a post-Brexit setting. The bill made it through the House of Commons relatively unscathed, with MPs approving only one amendment designed to empower parliament. That amendment made the delegation of powers to the government to implement the EU-UK withdrawal agreement in Clause 9 of the bill ‘subject to the prior enactment of a statute by Parliament approving the final terms of withdrawal of the United Kingdom from the European Union’. This means that, in order to be in a position to implement the withdrawal agreement domestically – which will be necessary – the government will need to seek parliament’s consent. This clause does not technically restrict the ability of the government to conclude the withdrawal agreement, though the negotiation of an unacceptable agreement might mean that it could not be implemented. At the same time, a refusal by parliament to approve the withdrawal agreement would not bind the government to seek an extension of the Article 50 deadline and renegotiate. The government could instead choose to crash out of the EU without a deal (see more detailed discussions). While this amendment therefore gives parliament some influence, it cannot prevent the threat of a no-deal Brexit. by 31 October 2018, a Minister of the Crown has laid before both Houses of Parliament a statement outlining the steps taken in negotiations under Article 50(2) of the Treaty on European Union to negotiate, as part of the framework for the United Kingdom’s future relationship with the European Union, an arrangement which enables the United Kingdom to continue participating in a customs union with the European Union. The government was quick to dismiss this amendment as having little bearing on the outcome of the negotiations concerning the future relationship between the UK and the EU. On one view, the government’s argument that this amounted to nothing more than a procedural obligation to update parliament by a given date might seem correct. The government’s statement required by the amendment could, for instance, merely say that it had taken no steps whatsoever to negotiate a customs union because it did not judge this to be a desirable goal. On another view, however, one could argue that this amendment presupposes that the government takes active steps towards a participation in some form of customs union. In the end, the political process may have to determine what the ‘correct’ reading is. In contrast to the somewhat ambiguous customs union amendment, the second amendment passed on 30 April – number 49, which can be found on first page of this list of amendments – takes a belt and braces approach. 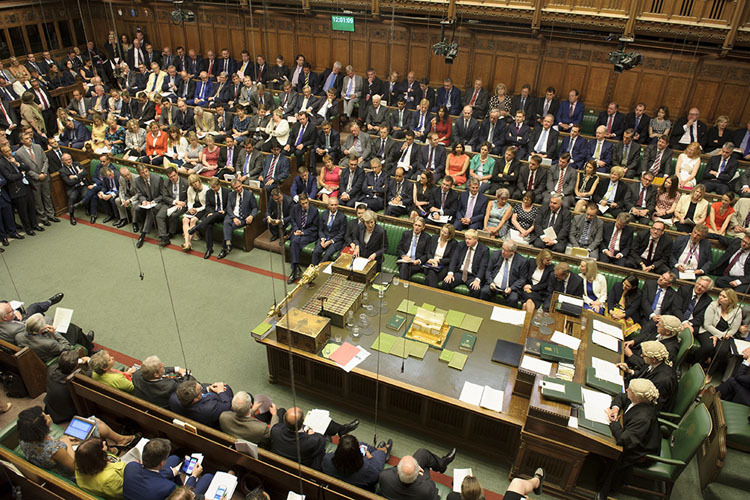 Instead of amending an existing clause in the bill as previous amendments did, it inserts an entirely new clause, which puts parliament in the driving seat on key questions concerning the withdrawal agreement. It does so in two interconnected ways. In addition, the ‘Government may implement a withdrawal agreement only if Parliament has approved the withdrawal agreement and any transitional measures agreed within or alongside it by an Act of Parliament’. The additional requirement to obtain approval by statute to enable the internal implementation of the withdrawal agreement is also broader than the Commons amendment, in that it goes beyond the activation of the powers granted by the EU (Withdrawal) Bill itself. The above clause would, however, only be activated if one of three conditions is met: (1) parliament has not approved a draft withdrawal agreement by 30 November; (2) an Act of Parliament approving the withdrawal agreement has not been passed; or (3) no withdrawal agreement has been reached by 28 February 2019. These conditions show that parliament’s right to direct the government is intended to be used mainly to avoid a no-deal Brexit. It does not go so far as to give parliament a general right of direction in the process of withdrawal. How likely then is it that these amendments will become law? If the Commons makes further amendments, the bill will go back to the Lords, which will then have a chance to put its amendments back in, and so on. This so-called ping-pong can go on for a long time, although the Lords tends to eventually give way to the elected House of Commons. Quite interestingly, the usual way of resolving such disagreement in favour of the House of Commons under the Parliament Acts 1911 and 1949 is not an option. Under these two acts, the House of Lords can only prevent a bill from becoming law for one session of Parliament, which usually lasts for one year. However, the current session lasts for two years and will end after 29 March 2019, when Brexit is supposed to have happened and the legislation implementing it must be in place. For this reason, it would perhaps be premature to conclude that parliament is now fully in charge of the Brexit process. What the amendments show, however, is that parliament can assert control if it chooses to do so.